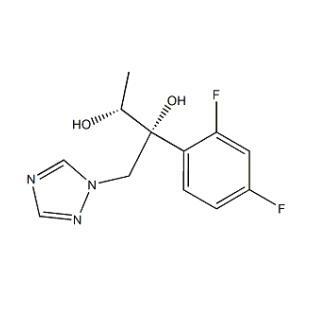 Efinaconazole Intermediate 3 of (2R,3R)-2-(2,4-difluorophenyl)-1-(1H-1,2,4-triazol-1-yl)butane-2,3-diol CAS number 133775-25-4,Molecular formula C12H13F2N3O2, Molecular weight 269.2473264. It is a high-level intermediates of Efinaconazole, and then by two step reaction can be obtained raw materials Efinaconazole. Our current production plan is within kilograms of demand, we put in laboratory production accordance with the GMP specification designed. Our laboratory has a variety of specifications reactor from 20 liters to 200 liters., according to the order quantity, we will flexibility arrange for production. If the order quantity exceeds 10 kg, we will put the pilot scale workshop for production. With the current market demand for Efinaconazole Intermediate 3, our production arrangements are fully able to meet the demand. We have many years of experience in the synthesis of Pharmaceutical Raw Materials and intermediates, especially good at anti-tumor drugs, Anti-fungal drugs and other products R & D and production. In the production process of Efinaconazole Intermediate 3, we will put product quality and safety on an unprecedented height, strict implementation of ISO, GMP and ICH requirements. Looking for ideal 133775-25-4 Manufacturer & supplier ? We have a wide selection at great prices to help you get creative. All the CAS 133775-25-4 are quality guaranteed. We are China Origin Factory of CAS Number 133775-25-4. If you have any question, please feel free to contact us.